We are beyond excited to tell you about our latest project: the Small Creek Channel Naturalisation, in Ipswich. These days Small Creek is a 1.6km long concrete drain that offers very little value to the community or environment. However not so long ago Small Creek was a meandering natural stream that flowed into Deebing Creek, and then into the Bremer River. Aerial photograph from 1946 shows Small Creek running east-west (right-left) in the centre of the image. The Ipswich Cemetery is above. Image: Ipswich City Council Library. Now, Small Creek will be reinstated as a natural waterway, in a project funded by Ipswich City Council’s Stormwater Quality Offsets Program. As well as clean water, the new Small Creek will allow for better path and bikeway connections, habitat for birds, and the opportunity to interact with nature in a parkland setting. Amalie Wright (Landscapology) and Alan Hoban (Bligh Tanner) are leading the project, with our fantastic joint team - Claudia Bergs, Stephanie Brown, Christina Gnezdiloff and Juan Castro - plus input from industry specialists including Dr Geoff Vietz of Streamology. We've been out on site a lot, getting a feel for the existing conditions. Lesson #1: it's hot. We've also been seeing what's there once you look beyond the line of the drain. As we tell our first year landscape students: no site is a tabula rasa; every site is full of information, all there for us to observe and synthesize. Starting Friday 11th November, our team will be set up on site for a week, so we can learn directly from the local community. As well as talking about what works now and what the challenges are, we’re also really interested in hearing from people who may remember what Small Creek was like before being channelised: we’d love to hear your stories of the creek, or see any old photos. Over the course of Design Your Creek Week we will be running focussed workshops with local community, industry and school groups, working with representatives, plus developing and testing concept design options live on site. 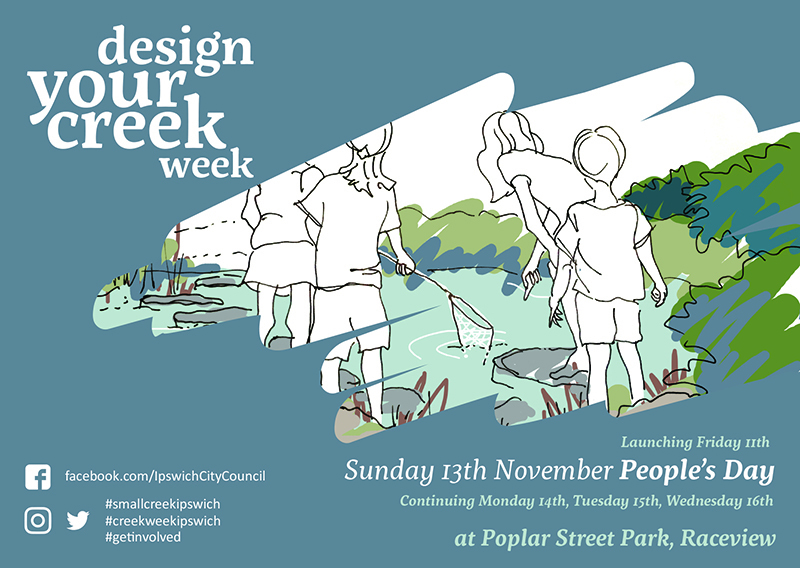 During People’s Day, on Sunday 13th, there’ll be art and craft sessions, interactive creek models where children (and adults!) can create their own interactive stream experience, short information talks, books and videos to inspire, plus a free sausage sizzle. There’s more information on Ipswich City Council’s website, and you can register interest in attending on Council's Facebook event page.